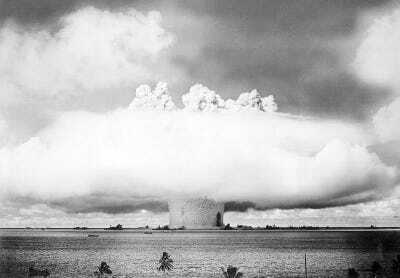 Wikimedia CommonsThe Marshall Islands served as a test theatre for American nuclear weapons from 1946 to 1958. More than 60 years after the US dropped dozens of nuclear bombs on the Marshall Islands, residents of the tiny nation still may not be able to return. Radiation levels in some areas of the country are almost double what is deemed safe for human habitation, according to a new Columbia University study in the journal Proceedings of the National Academy of Sciences. Between 1946 and 1958, the United States tested 67 nuclear weapons on the Marshall Islands, a chain of atolls in the Pacific Ocean with a population of just 52,000. The most famous test, the “Bravo shot,” was dropped on Bikini Atoll in 1954 and was 1,000 times more powerful than the bomb dropped on Hiroshima. 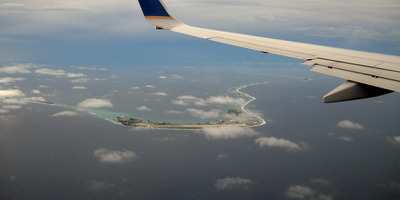 Residents of the atoll were displaced, and today it remains uninhabited. The researchers discovered that radioactive materials on Bikini Atoll are producing 184 millirems of radiation a year — almost double the safety standard of 100 set by the US and the Marshall Islands. Some parts of the region hit a whopping 639 millirems per year. Scientists had once predicted Bikini Atoll’s radiation levels to be as low as 16 millirems a year, suggesting that the radiation has persisted far longer than previously imagined, according to Science News. There is a silver lining for the Marshallese: The other five islands analysed in the study fell safely below the 100-millirems-per-year threshold. The research could help clear the way for many displaced Marshallese to return home. Currently, almost half of the population lives in the main urban area of Majuro, and as rising shorelines threaten to submerge entire islands, the country is becoming increasingly overcrowded. American nuclear testing remains an unmistakable piece of the national psyche, and officials continue to fight for global nuclear disarmament. In March, the nation sued the UK, India and Pakistan in a largely symbolic attempt to pressure them to dismantle their nuclear arsenals. Meanwhile, refugees and their descendants are finding homes in the United States, particularly in the thriving Marshallese communities in Honolulu and Springdale, Arkansas. More testing needs to be done on the islands’ food and water sources to determine whether they are safe for habitation, the scientists wrote.